The up-front cost of $2 billion contributed by the State is not the total actual cost to Victorians. 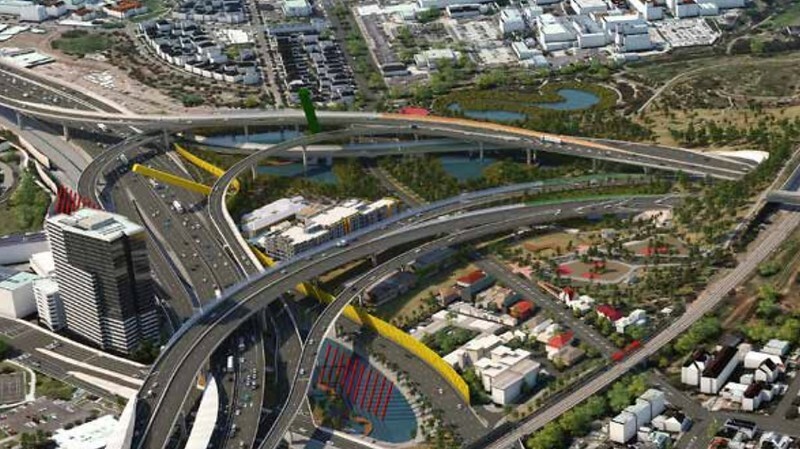 It’s also not the construction cost — long thought to be upwards of $6 billion, but now finalised at $6.8 billion. The consortium building it provides $3.3 billion. The Federal Government (which, remember, refuses to fund urban public transport) is providing $1.5 billion. The state is providing $2 billion. But the consortium doesn’t do this stuff out of the goodness of its heart; it needs to make its money back, plus a profit. The state has to pay Availability Payments to the consortium for 25 years. We don’t yet know how much they are because the Business Case has been kept secret, but Josh Gordon “conservatively” speculates that it could be $200 to $300 million annually, but it could be more. That means the Availability Payments would add up to be something in the range of $5 billion to $7.5 billion — a tidy profit to the consortium for a $3.3 billion up-front outlay (though they’d also be paying maintenance costs during that time). The cost to the state would be offset by the tolls. Again, we don’t know how much they will be or how much income they will bring in. Even if the business case was public, estimates for toll roads are notoriously inaccurate, with many Australian toll roads taking years to get to anywhere near their “steady state” volume of traffic and income levels. And tolls may extend well beyond the contract period of course. + more in toll money if they continue after that. That $2 billion road is actually something like a $10 billion road, for 5.5 kilometres. And that’s just, the eastern section, stage 1. — for a road which is unlikely to have any lasting impact on traffic congestion. Josh Gordon’s article had one minor error in his article, which he has acknowledged: Citylink can’t get compensation if an airport passenger rail link is built: the contract specifically rules compensation out. The Linking Melbourne Authority appears to have no high-resolution photos. Even their Youtube videos are limited to 720p. Perhaps they can’t afford anything better. Thanks for explaining the financial side. I’m unclear as to why there needs to be an “Availability Payment”. The State gives the operator the land, funnels traffic into their road, and the operator charges a toll. What more do they want? @Roger, yeah that’s how it works on Citylink: the operator gets the tolls. If the tolls aren’t enough to cover the construction and operating costs, they lose out, though in Citylink’s case they’re making huge amounts of money, perhaps in part because they were given existing roads to upgrade/widen and then impose tolls on. In the case of EWLink (eastern section), the government gets the tolls, and pays Availability Payments to the operator. This means if the toll revenue isn’t as high as expected, the risk is with the taxpayer, not the operator. PeninsulaLink is different again. No tolls involved; the government just pays Availability Payments to the operator. Has the Government stated whether the availability payment contract has an end date? I’ve heard “25 years is the life of the project” bandied about quite a bit, so I presume that means an end date… but of course “commercial in confidence, hush hush…”. I’m actually failing to see where East West Connect have any real risk. I suppose their could be some cost blowouts during construction, but realistically once construction has started if EWC put their foot down and refused to finish the project without higher availability payments no government would risk re-tendering and would cave in to their demands. @Julian, it’s 25 years after completion. Obviously the exact date won’t be known for some time. The East West link, (Or the Eddington freeway as I prefer to call it) could have been done at a much lower cost than what the reality is. While I have been somewhat open minded about stage one, if I get into parliament at this election, I aim to oppose stage #2. Grand total of $2,8000 M. That is a long way short of $10,000 M of just one freeway. There should be plenty left over for rail standardisation all over Victoria, and the Melbourne Airport railway too.